To view and edit the properties for a video, open the Media module and click the video title link. The video properties page will open. Note: To edit video properties for multiple videos at the same time, use the Quick Edit feature. If the video is activated, the Deactivate button can be used to deactivate the video. If the video is deactivated, the Activate button can be used to activate the video. Videos that are deactivated cannot be played in a Brightcove Player. The preview player at the top of the page can be used to view the video. To edit the video properties, click the Edit button in the section or double-click in the section. Your Video Cloud account may be configured with required metadata fields. If a video is inactive, you can freely edit and save its metadata without supplying all required metadata. Also, videos can't be activated until all required metadata has been entered. If a video is already active, you cannot save any edits in the section you are editing unless you supply all required metadata in that section or deactivate the video. For more information on working with required fields, see Setting Required Fields for Videos. The Video Information section can be used to view and edit basic video properties. Name - No more than 255 characters. 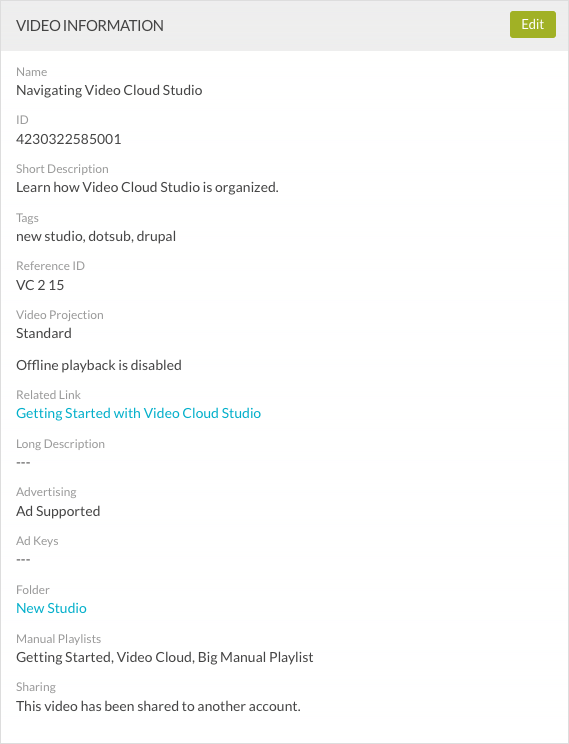 ID - System assigned video ID (unique across all Video Cloud accounts). Short description - No more than 250 characters. Tags - One or more tags, separated by commas. You can use tags to add videos to smart playlists or to find videos using the CMS API. Tags can be up to 128 characters. If any tags have more than 128 characters, an error will be displayed when you attempt to save changes. Tags can't contain commas. For example, a tag of "roof, attic + front yard" is not supported. A video can have no more than a total of 1200 tags. A tag differing only in case (lowercase, uppercase) is handled as an identical tag and the case will automatically match those of the original tag. After entering a tag, press the comma key or enter. Tags that have been added will display in a colored box. Reference ID - A unique ID assigned by a publisher to a video or playlist. Limited to no more than 150 characters. The reference ID is distinct from the video ID or playlist ID which are unique IDs generated by Video Cloud. The reference ID enables coordination between Video Cloud and other services such as a publisher's content management system. Note that you can't batch edit the reference ID as two videos can't have the same reference ID. Reference IDs must always be unique. Deleting a video will allow a previously assigned reference ID to be reused. Video Projection - Indicates how the video was recorded. Standard - Default. Regular video recording. 360 Degree - Check to indicate the video is a 360 degree video. A 360 badge will appear in the video thumbnail in the Media module. For more information on working with 360 degree videos, see Working with 360-Degree Videos. 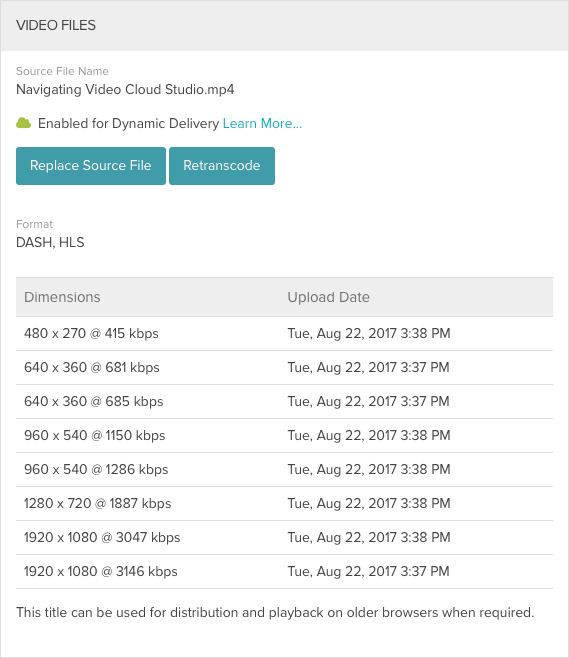 Enable offline playback - When checked, enables the video to be saved locally and viewed offline when using applications created using the device SDKs. This option will only appear if the account is enabled for offline playback. Related Link URL - A standard web URL beginning with http:// or https:// limited to 255 characters. Related Link Text - Related link text limited to 255 characters. Long Description - No more than 5000 characters. Free - Ads will not be shown when the video plays. Ad Supported - Ads may be shown when video plays. Note: If your account is not enabled for advertising and you set the Advertising property to Ad Supported, you will receive an error when saving changes. Ad Keys - Passed as part of the ad server URL. For example, to pass section=blog and anotherKey=value1, you would enter section=blog&anotherKey=value1. See the DoubleClick for Publishers Help for information on adding key-value pairs. When using ad keys, ad macros should be added to the ad server URL (configured as part of the player advertising properties). Ad macros support variables in the server URL for which the IMA3 plugin will substitute appropriate values. For more information, see the IMA3 developer documentation. Folder - Folder the video is assigned to. See Organizing Videos Using Folders for more information. Manual Playlists - Playlists that this video belongs to. For more information, see Creating and Managing Playlists. Sharing - Indicates if the video has been shared to another account. For more information, see Media Sharing using the Media Module. In this example, Legacy transcoding was used (when the video was uploaded, a Legacy ingest profile was used). To download a rendition, right-click on the format link for the rendition. In this example, Dynamic Delivery transcoding was used (when the video was uploaded, a Dynamic Delivery or Context Aware Encoding ingest profile was used). 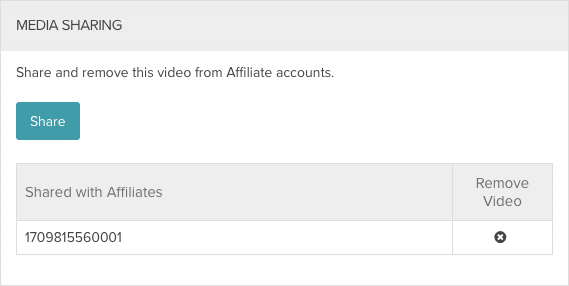 If the video has been shared to an affiliate account, the Media Sharing section will be displayed and list the affiliates the video has been shared to. For more information on media sharing, see Media Sharing using the Media Module. If the video was uploaded and transcoded using a Dynamic Delivery or Context Aware Encoding ingest profile, the Audio Tracks section will be displayed and contain information on the audio renditions that are available. For information on adding additional audio tracks to a video, see Adding Audio Tracks to Videos using the Media Module. Note: The Audio Tracks section will not be displayed if the video was transcoded using a Legacy ingest profile. The Images section displays the poster and thumbnail images for the video. 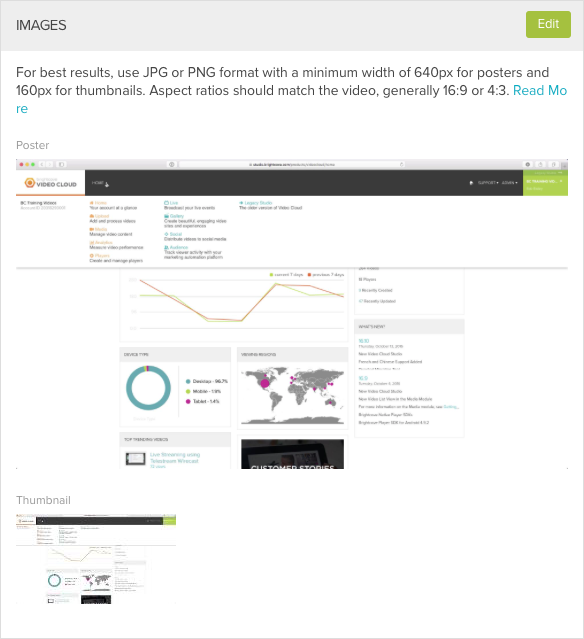 Poster and thumbnail images are created automatically by taking a snapshot from the source video at the midway point. If you don't like the default images that were captured, you can capture new images or upload other images to use as the poster and thumbnail. 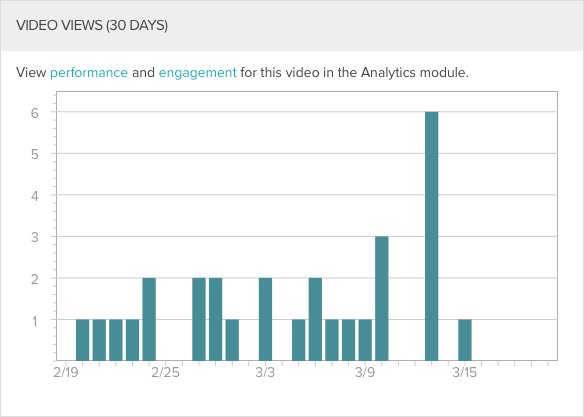 The Video Views section displays the number of video views for the past 30 days. 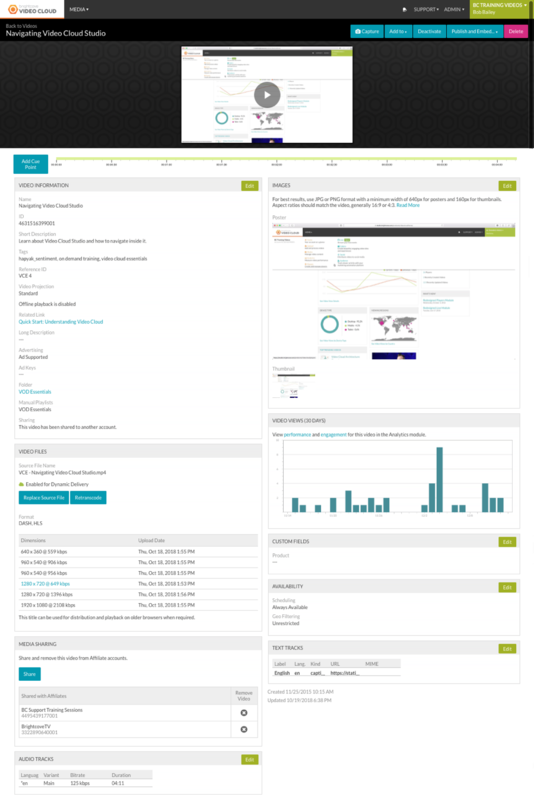 Click the links to open the Performance or Engagement Reports for more information. The Custom Fields section can be used to view and edit the custom field for the video. To edit custom field values, click the Edit button or double-click in the section. An asterisk (*) next to the field name indicates that the field is required. Note: For information on adding custom fields to an account, see Creating Custom Metadata Fields. The Availability section displays the video availability settings. 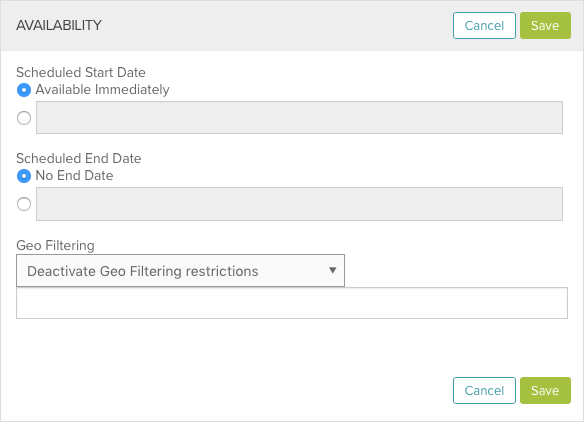 For more information on configuring the availability settings, see Configuring Video Availability. The text track section can be used to add text tracks to the video. For more information on configuring text tracks, see Adding Captions to Videos using the Media Module.